At the close of the past century, the revitalized draft animal power movement was proceeding steadily with its initial plowing, cutting a fresh regenerative swath nationwide into the stagnant and wearisome, mono-cultured agribusiness that has dominated that landscape since mid-century. The degraded petro chemical approach to farming is “going by the way-side,” replaced by the single- and multi-hitch plow alike and the sweet scent and “invigorative natural processes” of the closed-farm fertility. The dawn of the 21st century finds teamsters, their animals—horses, oxen, donkeys, and mules in particular—and innovative equipment manufacturers collaborating in a groundswell of mutual activity, naturally lending itself to other forms of regenerative farming, including organics, crop rotation, and small-scale farming. The clock is not being turned back to some halcyon isolated moment in time and history and place; rather, in the turn to the next furrow, these practitioners are promoting an agroecological mindset capable of long-term sustenance that should carry us into good stead through this century. And, as Stephen Leslie who farms Cedar Mountain Farm, a Fjord-horse-powered CSA and Jersey cow dairy at Cobb Hill Co-Housing in Hartland, Ver-mont ably demonstrates in his new book Horse-Powered Farming for the 21st Century, at once complementing and expanding on his 2013 book, The New Horse-Powered Farm, already reviewed in these pages and readable at www.thenaturalfarmer.org, he has become the leading chronicler of this movement. The earlier book served as an introduction to the requirements of operating a successful market garden with animal power and included an overview of horseman-ship skills and training. 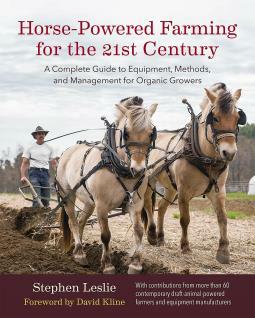 In this new book Leslie focuses his attention on the tools and methods necessary to manage a horse-powered market garden, examining the function and use of various implements as they uniquely apply to such topics as managing fertility and cover crops, seeding, transplanting, irrigation, cultivation and harvesting. Leslie draws on more than applying the experiences of his own twenty plus years of farming. And in this second volume he does more than just provide farm profiles as in the first work; here, he celebrates these like-minded practitioners by giving them add-ed space to share their stories, analyzing the equipment they utilize, explaining how their systems and techniques work, and where and when they work best. “This assemblage of seasoned voices is no mere historical archive,” he contends; they “hold treasures of experience and knowledge that we need now and may need even more tomorrow.” No argument there. A humble farmer, Leslie is also the humble compiler: “rather than placing protective earmuffs on our heads to shut out the roar and din of the tractor, we are invited to open our senses more fully to the experience of the here and now.” “Such attunement,” he adds, “is essential to good farming,” and, this homesteader and fair trade advocate might add, to being a good reader and enlightened shopper. In his chapter on Plows and Plowing, for example, he includes anecdotes from those who favor both the walking plow and the sulky; his explanation for this deci-sion is representative of his inclusive approach generally: Although I have written my own positive review of this model of plow, I thought it best to seek out another experienced horse farmer/market gardener to give us his take on the merits of this plow…to provide a balanced picture and to suggest that although a book like this one can provide road maps you will likely have to try out some different plows to your own unique situation to discern which plow is right for you, your soil, and your horses. Who is the ‘expert’ in this situation? And try employing such a strategy with tractors!